Giving up drugs is a scary enough proposition for the addict, and entering a strange new place while putting your life into the hands of others, can make it even more difficult. When an individual enters into a drug rehab facility, is can be an intimidating, sometimes frightening experience. Even the drug rehab admissions procedure can be stressful if one does not know what to expect. But the drug rehab admissions process does not need to be a fearful time. Just remember that the people who check you in to drug rehab are there to help you first and foremost. And when they admit you into the facility they just need to learn more about you -and make sure that your experience at the facility is safe and productive. There are certain items that you can and can’t bring into a drug rehab facility. The policies obviously differ from facility to facility but here are some of the most common items allowed and forbidden. 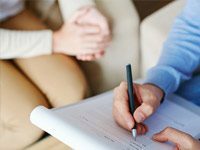 The drug rehab admissions process is different everywhere, but by knowing and understanding some of these common elements you will be better prepared when you go through the admissions procedure. At Michael’s House, we strive to make the admissions procedure as quick and friendly as possible. We understand that drug rehab admissions can be intimidated and do everything we can to show our residents that they are among people who care.